From this viewpoint, you get the first glimpses of the three bridges. 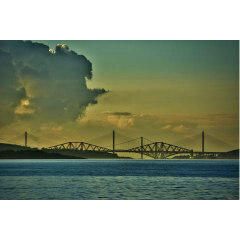 The Forth Bridge is the first, and oldest, an iconic railway bridge and a UNESCO World Heritage Site. Construction of the bridge began in 1882 and when it was opened on 4 March, 1890, it was the longest single cantilever bridge span in the world. It held that record until 1919 when the Quebec Bridge in Canada was completed. The second bridge is the Forth Road Bridge, a suspension bridge that opened in 1964 and, at the time, was the largest suspension bridge in the world outside of the United States. At its peak, the Forth Road Bridge carried 65,000 vehicles per day. On 5 September 2017, all bridge traffic was transferred to the Queensferry Crossing, the third bridge which stands parallel to the Forth Road Bridge. The new bridge is a cable-stayed structure, with three towers each 207 metres (679 ft) high. 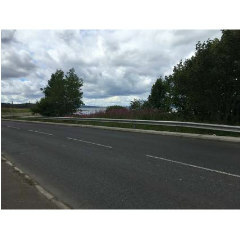 Including approaches, the overall length of the bridge is 2.7 kilometres (1.7 miles). Currently, it is the longest triple tower cable-stayed bridge in the world. The three bridges, built in 3 different centuries: 19th, 20th and 21st. Photo from the John Dickson collection.